In the Health and Human Services Committee, we have heard a few different insurance plans that would be cheaper and less comprehensive alternatives to the Affordable Care Act (ACA). With SB1107, healthcare moves into the gig economy. SB1107 covers direct primary care agreements, a non-insurance alternative to the ACA. In Arizona, people are already allowed to make one-on-one contracts with a healthcare provider for certain services for a designated mount of money per month. This bill clarifies existing law and says that these contracts are not insurance and, therefore, not regulated by the Arizona Department of insurance. It also says that you can have contracts with doctors, physicians assistants, nurse practitioners, nurses, dentists, and physical therapists. If you take this to it’s illogical extreme, you could have multiple contracts with different providers for different menus of services. Unless you are really good at contract law, you could end up having several contracts, paying monthly bills to each of these providers and still not getting the care that you need. Since these plans are not insurance, you would not be able to take your complaints to a bureaucrat at an insurance company or at the Department of Insurance. Direct current primary care agreements are supposed to fill a niche in the healthcare market. The ACA is too expensive, particularly for sole proprietors. These are business people who are their business. Professional people, consultants, artists and musicians could all be sole proprietors. The Arizona House has begun debating HB2657, a high-tech workforce development bill which would funnel money through the Arizona Commerce Authority to community colleges to train workers in “high-demand” fields. The CEO of the Commerce Authority would manage the fund created by this bill, and they would determine what to fund. Why are we focusing only on manufacturing, financial services and technology? Previously, we saw this with CTED (formerly JTED) classes. In the last session, proposed legislation would have funneled 9th grade students into select industries like machine tooling, aerospace, and automotive services, while they left healthcare, coding and other careers by the wayside. To meet the needs of our state, workforce development could and should go beyond tech. Why is healthcare not included in HB2657? We have a need for expanded access to care particularly in rural Arizona, and we do not have enough medical and health professionals to fill the gaps. We could train rural Arizonans to be community health workers, certified nursing assistants and home health aides. When I taught health education at the University of Arizona, I had many students from rural Arizona, particularly tribal lands, who were studying in Tucson and planned to take their new skills back to rural Arizona to help their people. How can we foster this? Arizona has five rural counties — Cochise, Gila, Graham, Santa Cruz and LaPaz– that are considered maternal and child health deserts because of lack of medical personnel and health services in those areas. The face of premature birth in Arizona is young, brown and rural. Every preemie birth that is funded by AHCCCS costs the state between $500,000 – $1 million. We could improve access to care, foster workforce development, save money and tackle urban/rural health disparities if we put as much effort into the healthcare workforce as we do into tech. The worst vote of the 54th session has to be the Republican passage of the sub-minimum wage on Thursday. Rep. Travis Grantham’s HB2523 would allow employers to pay full time students, who work part time and are under 22, the federal minimum wage of $7.25/hour, instead of the voter-approved minimum wage of $11/hour. Republicans and Democrats debated HB2523 for more than one hour the day before during Committee of the Whole (COW) and again when we explained our votes on Thursday. It passed on a strictly party line vote. The Arizona House is moving at a snail’s pace this session. In fact, Senator David Bradley has quipped that the Senate should take a one-month vacation so the House can catch up. According to the Chief Clerk, as of Friday, the end of the fifth week of session, 744 House bills were dropped. Forth-seven percent of the bills (349)– including the Equal Rights Amendment (ERA)– have not been first read (the first step in the process). Only 50 bills (7%) have been third read (the final vote). We voted on about half of those 50 on Thursday afternoon. The coming week will be NUTS because it is the final week for the House to hear House bills and for the Senate to hear Senate bills. At this point, there are a lot of bipartisan bills on the cutting room floor in the Speaker’s office. What has been left unheard in committee or on the floor? Plenty. HB2523 is on the agenda for the Regulatory Affairs Committee for Monday, Feb. 11. This is a terrible bill for younger workers who are under 21 years of age, employed in the gig economy, and full-time students. This bill allows employers to pay you less than Arizona’s current minimum wage of $11 an hour. They can go as low as the current federal minimum wage which is $7.25 an hour. You have until 2 o’clock on Monday to voice your opinion on the request to speak system. Tell the Republicans loud and clear that this is not fair to younger workers! Why are we saddling college students with enormous debt and then forcing them to work for slave wages? Go to RTS as the AZLeg website. I am ranking member on the Regulatory Affairs Committee. We have heard many bills about dumbing down qualifications for professions and other bills that are bad for workers. Nov. 6, 2018 is a day that millions of Democrats have been waiting for and working toward for the past two years. Since President Trump’s election, people have been organizing and working hard toward nationwide Democratic victories in 2018. Every Presidential Tweet and every backward policy announcement made us cringe but also made us stronger in our resolve to take back our government and our country. With door-to-door canvassing, postcards, and e-newsletters, my team has reached out to more than 80,000 LD9 voters. With social media, the reach is well over 100,000. On Nov. 6, it is your turn. 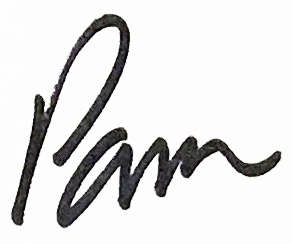 I hope you will consider voting to re-elect me– Pamela Powers Hannley– to the Arizona House of Representatives. When I ran for office in 2016, I said I wanted be your voice—the voice of the people—in the Arizona Legislature. And that is exactly what I did. I used my voice, my votes, my amendments, and my bills to fight for the rights and wellbeing of workers, patients, teachers, students, women and the underserved. Where I stand on the issues… check out these links for information and videos on specific issues. Overall look at issues here. Specifics about education and funding for it here and here. Check out news stories and interviews here. Many have endorsed me… check out this link. As a progressive Democrat and a Clean Elections candidate, I accept no big money donations or dirty money. As a result, I am beholden only to you, the voters– and not to wealthy national donors or special interest groups. I want to continue to be your voice– the voice of the people– in the Arizona House. Our work is not done. Please vote for my on Nov. 6, 2018. Thank you so much for your support. During my interview with them we delved deep into public education, vouchers, charter schools, teacher pay, Red for Ed, tax giveaways and strategies for funding public education. Check out the interview link below. #RedForEd lifted the veil from our eyes and put the issue of corporate tax giveaways front and center in the fight to restore public education funding in Arizona. As many of you are aware, the Arizona Legislature is giving away more than $13 billion in taxes every year and using only $10 billion to run the state. It is not sound fiscal policy to use accounting gimmicks and 50 fund transfers to “balance” the budget. It is no surprise that the state owes K-12 education around $1 billion. Thanks to scheduled corporate tax cuts passed by the Tea Party*, beginning in 2011, Arizona’s corporations got to keep an extra $1 billion in 2017. These corporate tax cuts continue through 2019, even though we can’t afford them. As a result of the anger and frustration that many Tucsonans feel about the Arizona Legislature’s performance, the Stop Thief! Let’s Restore Fair Taxes Community Forum drew a standing room only crowd of diverse participants. The event was hosted by the Pima Area Labor Federation (PALF) and Progressive Democrats of America (PDA Tucson), with support from many other unions and community groups. 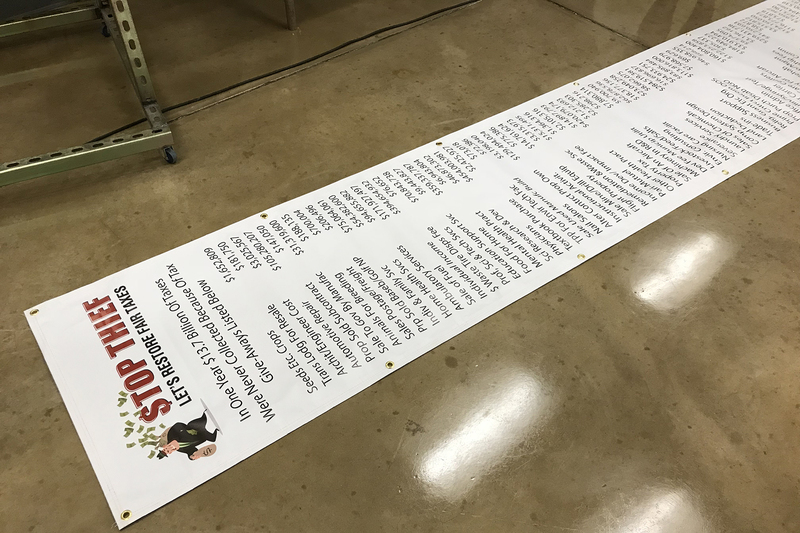 The star of the tax forum was the 20-ft banner listing 195 of Arizona’s 334 tax giveaways. Arizona is giving away $13+ billion is taxes each year and using only $10 billion to run the state. It is not sound fiscal policy when you use accounting gimmicks and 50 fund transfers to “balance” the budget. Heart-felt testimonies from current high school students, who explained how school budget cuts have impacted their lives and their schools, opened the forum. My talk focused on specific tax giveaway votes in the 53rd Legislature. focused specific tax giveaway bills and the drama that swirled around the bills that passed and the ones that failed. (Video after the jump.) Excluding any votes related to budget appropriations, all of the tax giveaway votes in the 53rd Legislature were bipartisan— with Democrats and Republicans on both sides. The Legislature’s mindset on tax giveaways shifted from January 2017– when two Progressive Democrats made a pact to vote against every tax giveaway until the schools were fully funded– to budget night in May 2018. The Progressive viewpoint was: If the state “can’t afford” to fully fund K-12 public education (due to self-imposed austerity), then we “can’t afford” to give away or excuse any more taxes until the schools are on stable footing and fully funded. Thanks to the #RedForEd movement, on budget night 2018, hundreds of teachers, parents, and supporters filled the House gallery and the Capitol lawn and demanded that public education take priority over corporate tax cuts. As I mentioned in my talk, a thorough tax giveaway review bill and several tax reform or repeal bills were proposed in the Legislature in 2018. Unfortunately, due to the gamesmanship at the Capitol, these bills were not heard because they were proposed by Democrats: Senator Steve Farley and Reps. Mark Cardenas, Randy Friese, and Pamela Powers Hannley. It’s time to review all of the tax cuts, tax exemptions, tax credits, tax subtractions, and other tax loopholes. Some of these tax giveaways benefit narrow interests– to the detriment of the general fund and the general public. We must determine which tax exemptions benefit the people of Arizona (like the TPT exemptions for food and prescription drugs); which ones benefit special interest groups (like gold bullion enthusiasts); which ones benefit individual corporations (like the infamous four-inch pipe); which ones we are effective and affordable; and how we can spark economic development without breaking our budget and starving all of our educational institutions, as we are now. Several people told me that they felt hopeful after my talk because so many costly tax giveaways were stopped on a bipartisan vote. If fact, all of the tax giveaway votes were bipartisan— with Democrats and Republicans on both sides. This is why it is important to ask every candidate in the 2018 election what their stance is on tax giveaways, the #RedForEd movement, the Invest In Ed Citizens Initiative (to secure long-term funding for K-12), and the Outlaw Dirty Money Citizens Initiative. Will these candidates fight for the people or will they “take the money and run”?